I have written and spoken about the real (and perceived) legal obstacles to hastening death by Voluntarily Stopping Eating and Drinking (VSED). But please check out this new family perspective (Amazon). 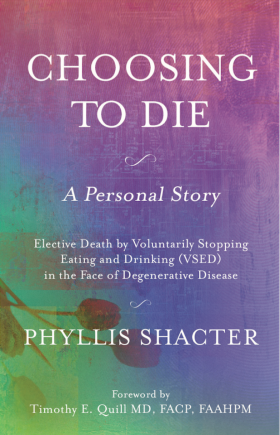 In Choosing To Die: A Personal Story: Elective Death by Voluntarily Stopping Eating and Drinking (VSED) in the Face of Degenerative Disease, Phyllis Shacter courageously shares the first personal story ever written about VSED. This memoir and guidebook follows the journey she took with her husband, Alan, once he decided to VSED so he didn’t have to live into the late stages of Alzheimer’s disease. This is their love story, their partnership, the brave territory they traversed, including how they prepared themselves with proper medical and legal guidance when electing to VSED. Choosing to Die is filled with emotional depth and sensitivity as well as practical information outlining the process from beginning to end. Phyllis shares every detail, including what Alan experienced during the nine-and-a-half days it took for him to die, and how the experience transformed Phyllis. This book is for anyone who wants a deeper understanding of end of life choices, and especially for anyone who has been diagnosed with a degenerative disease. Phyllis Shacter is a retired teacher, business consultant, life coach, and public speaker. In addition to the book, check out Phyllis’ website for the most comprehensive resources on VSED.